featuresClear 8-point text8 Pages of Full-Color MapsConcordance with over 12,000 entriesWeights & Measures TableSmyth-sewn binding for extra strengthTwo-column FormatWords of Christ in RedPresentation PagesFamily Record SectionRibbon MarkerGold Page Edging Genuine Leather, Black8.75" x 5.75" x 1.00"
ESV Thinline Bible Black, Genuine Leather by English Standard was published by Crossway in March 2003 and is our 4242nd best seller. The ISBN for ESV Thinline Bible Black, Genuine Leather is 9781581345032. Be the first to review ESV Thinline Bible Black, Genuine Leather! Got a question? No problem! Just click here to ask us about ESV Thinline Bible Black, Genuine Leather. Another question - does this ESV Thinline Bible (Black) have central cross-references? A:The ESV Thinline Bible (Black) does not have central cross references. It does have 12,000-entry concordance however. 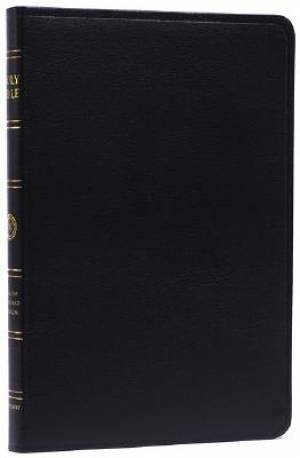 Is the ESV Thinline Bible (Black) a red letter bible? A:The ESV Thinline Bible (Black) does have the words of Christ in red.